BANGUED, Abra – Presidential Adviser on the Peace Process Jesus G.Dureza vehemently denied having authorized self-styled individuals and groups to recruit purported combatants from the different parts of the region to become members of the so-called regional security force once federalism will be in place. 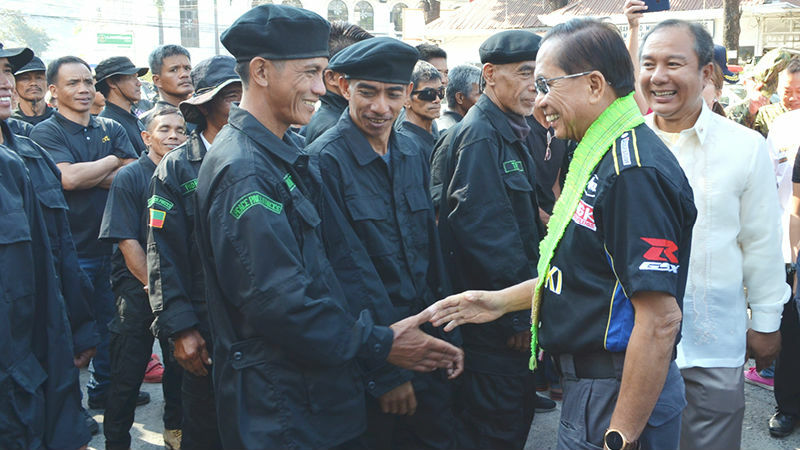 Dureza, who met with the leaders and thousands of members of the Cordillera Bodong Administration – Cordillera Peoples Liberation Army (CPLA) unified command led by Vice Governor Ronald Balao-as Wednesday, underscored the Office of the Presidential Adviser on the Peace Process (OPAPP) will never grant authority to individuals and groups, especially those with questionable reputations, to recruit potential members of a regional security force because it is not part of their mandate to be issuing such authority, thus,, Cordillerans should not be again hoodwinked in joining the said groups because their promise will surely not be realized. “We never authorized individuals or groups to recruit combatants to become future members of the regional security force because it was never part of any discussions during our previous meetings. Cordilleran should be warned against the unauthorized, illegal and questionable acts of these people because recruitment for a regional security force was never part of the agenda of our previous engagements in case,” Secretary Dureza stressed. The Palace official also denied having given recognition to the group of Conrado Dieza or Mailed Molina because the policy of the present administration in peace building efforts is inclusive and that the documents being shown by the said individuals to entice people to join their armed group which allegedly came from his office was a mere endorsement to the office of the Executive Secretary regarding their clamor for the revival of the disbanded Cordillera bodies and it does not mean that they are the ones that are recognized when there are other groups that were left out in the purported 2011 closure agreement. Earlier, numerous complaints have reached the OPAPP stating among others that Dieza and Molina have been going around the region allegedly recruiting possible combatants to become members of the regional security force once the Cordillera will become a federal state using some documents purportedly signed by Secretary Dureza to entice the young ones to join since their group is the one recognized by the present administration. According to him, it is the Armed Forces of the Philippines (AFP) which is authorized to recruit enlisted military personnel while it is the Philippine National Police (PNP) which is also authorized by the government to recruit peace officers pursuant to prescribed qualifications. The peace adviser asserted President Rodrigo Duterte remains committed to support the region’s renewed quest for autonomy similar to what he has done to the Bangsamoro Basic Law for Mindanao that is why it is still best for individuals and groups to embrace the direction established by the Regional Development Council (RDC) which is autonomy towards federalism. Autonomy advocates and the drafters of the third Organic Act deleted the provision that seeks for the establishment of a Cordillera Regional Security Force because it was one of the controversial provisions that resulted to the outright rejection of the previous autonomy laws that were passed in Congress in the past.